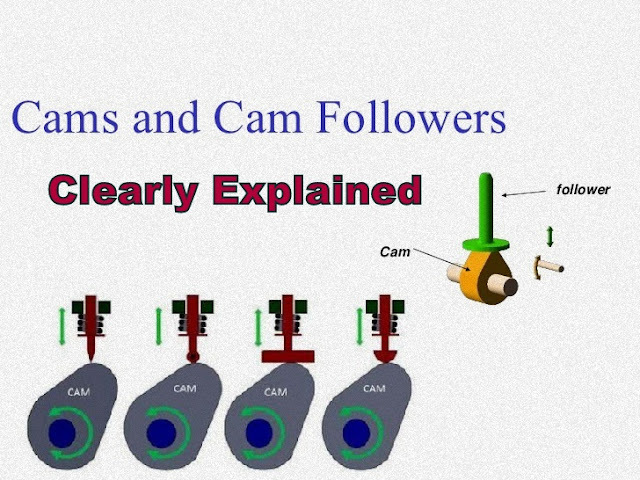 A cam is a mechanical device used to transmit motion to a follower by direct contact. The driver is called the cam and the driven member is called the follower. From a functional viewpoint, a cam-and-follower arrangement is very similar to the linkages. The cam accepts an input motion (rotary motion or linear motion) and imparts a resultant motion (linear motion or rotary motion) to a follower. A familiar example is the camshaft of an automobile engine, where the cams drive the push rods (the followers) to open and close the valves in synchronization with the motion of the pistons. Cam profile:- Cam profile is outer surface of the disc cam. Base circle:- Base circle is the smallest circle, drawn tangential to the cam profile. Trace point:- Trace point is a point on the follower, trace point motion describes the movement of the follower. Pitch curve:- Pitch curve is the path generated by the trace point as the follower is rotated about a stationery cam. Prime circle:- Prime circle is the smallest circle that can be drawn so as to be tangential to the pitch curve, with its centre at the cam centre. Pressure angle:- The pressure angle is the angle between the direction of the follower movement and the normal to the pitch curve. Pitch point:- Pitch point corresponds to the point of maximum pressure angle. Pitch circle:- A circle drawn from the cam center and passes through the pitch point is called Pitch circle. Stroke:- The greatest distance or angle through which the follower moves or rotates. Because of its simplicity the Disk or Plate type cams are most commonly used Cam's. 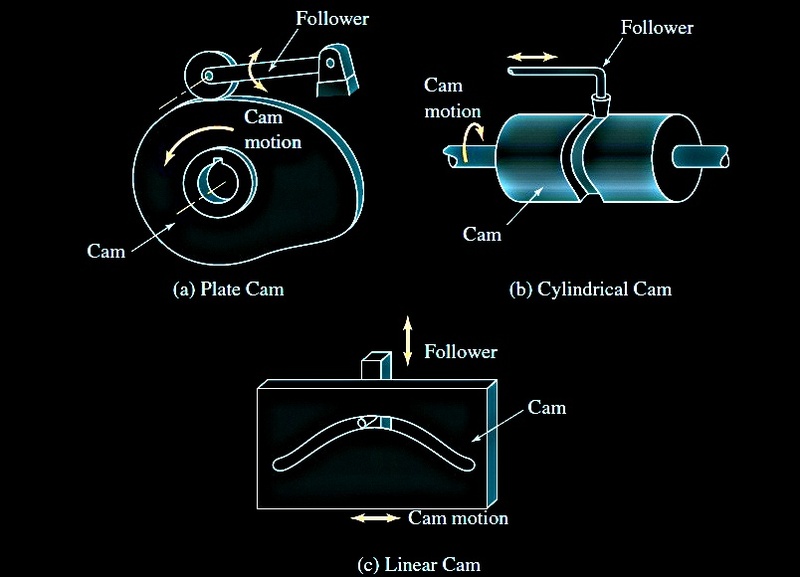 The disk (or plate) cam has an irregular contour to impart a specific motion to the follower. The follower moves in a plane perpendicular to the axis of rotation of the camshaft and is held in contact with the cam by springs or gravity. The cylindrical cam has a groove is cut into the cylinder, with a varying location along the axis of rotation. The roller follows the groove, and the follower moves in a plane parallel to the axis of rotation of the cylinder. 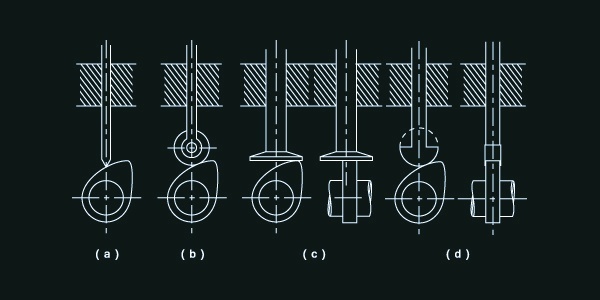 This type of cam is formed on a translated block. A groove is cut into the block with a distance that varies from the plane of translation. Attaching a follower that rides in the groove gives the follower motion perpendicular to the plane of translation. It is the simplest form,this type of follower is very rarely used. Because as per name knife follower has knife edge and knife edge has a surface contact with cam profile (cam profile is a shape of cam).So due to the sharp edge produces high contact stresses and wears rapidly.Due to wear cam profile change with time and does not work correctly. That is reason due to which knife edge is not use in practice. This is the most commonly used follower, as the friction and contact stresses are lower than those for the knife-edge follower. Because as per name roller follower has roller and surface contact between cam and follower is rolling contact. However, a roller follower can possibly jam during steep cam displacements. This type of follower can be used with a steep cam motion and does not jam. Consequently, this type of follower is used when quick motions are required.Flat follower has flat profile at surface contact between cam and follower. It is useful where space is limited. Flat follower is used in automobile engine where space is limited.However, any follower deflection or misalignment causes high surface stresses. In addition, the frictional forces are greater than those of the roller follower because of the intense sliding contact between the cam and follower. In flat face follower, stresses are produce. In order to reduce this stresses flat face is machined into spherical shape called as spherical follower. As with the flat-faced follower, the spherical- face can be used with a steep cam motion without jamming. The radius face compensates for deflection or misalignment. Yet, like the flat-faced follower, the frictional forces are greater than those of the roller follower. 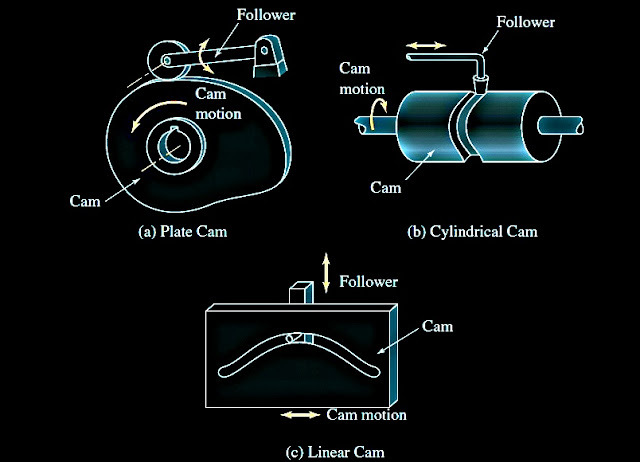 In this type of follower, follower have translatory motion means cam is rotating and follower reciprocating between guide way. Example of this type follower is knife edge follower, roller follower, flat follower and spherical follower. In this type of follower, follower has oscillating motion. Cam rotates and as per cam profile follower also move but follower is fixed at point about which follower is oscillate. This type of follower is called as oscillatory motion type follower. In radial follower, axis of follower and centre of cam are in one line or axis of follower is passing through centre of cam is called as radial follower. Example of this type follower is knife edge follower, roller follower, flat follower and spherical follower. In offset follower, axis of follower movement is offset from the centre of cam about which cam rotate is known as offset follower.